Monrovia, August 2, 2018: Internal Affairs Minister Honorable Varney A. Sirleaf has called on Islamic leaders of Liberia to resist any form of gossips, segregation and other vices which have the propensity of undermining the already existing peace and unity in the country. The Internal Affairs Minister said these acts will not only divide the Muslim community, but also weaken ongoing reconciliation efforts of Government. According to a press release, Minister Sirleaf spoke Thursday at his Capitol Hill office during an acquaintance meeting with a group of aged Islamic leaders under the banner of Liberia Muslims Elders Supreme Council for Empowerment. The Minister reiterated Government’s commitment to religious tolerance as required by law saying President George M. Weah respects and is willing to work with everyone for the betterment of the Country and its people. 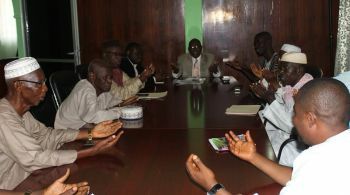 Speaking earlier, Alhaji Sedekie A. Turay, Chairman of the Liberia Muslims Elders Supreme Council for Empowerment told the Minister that the organization was established to serve as an advisory council of Muslims at all levels and to help promote peace in the Muslim community. Alhaji Turay said the group’s membership is made mostly of elderly people whose wisdom would be utilized to settle disputes and provide insights on critical issues within their religious circle and the country at large. Meanwhile the Minister and the Muslim Elders Supreme Council have agreed to remain engaged in pursuit of working with relevant stakeholders to resolve unsettled matters within the Muslim community. The release concluded.